Max is already six weeks old! I can't believe it. He's still so small, but he has changed so much! This week he has been going through a lot. Earlier in the week he was eating much more frequently than normal. Lots and lots of eating. The last couple of days he has slowed down and he's very sleepy. It must be that six week growth spurt! He's growing so fast! 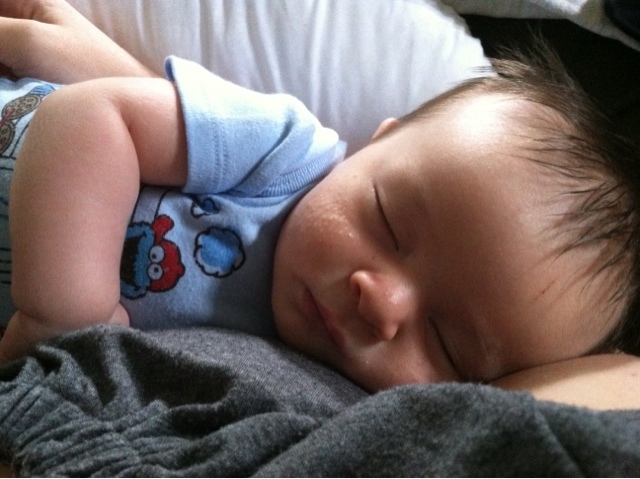 His sleepy days are lovely, and he doesn't want to sleep anywhere but on mommy's chest. I absolutely love it. 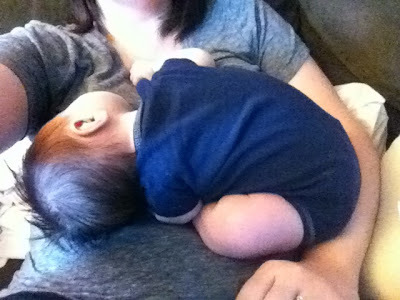 He finds a way to wiggle himself down, so he is curved around my body. It doesn't look comfortable to me, but he loves it. He lays like that for hours! Monday he started to smile when we blew raspberries on his belly. Before then, he would just look at us like crazy people. He loves it now. He also loves his little play gym, with a mirror hanging from it. He smiles at the mirror and laughs, wiggling with glee. He also likes to kick the big piano keys and play music. He really loves it, and it is so fun to watch him. I love that he smiles when he sees me, it is the cutest thing ever. He gets all excited when he hasn't seen me for a little while, and he smiles and kicks. 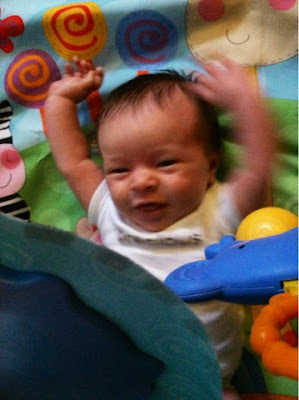 When I approach him, he puts his arms out to be picked up! I can't resist that, right? He's amazing. I love this little boy. So much. I love my awesome husband too. Our family is awesome. Life is great.